Anthill hunting – for people. for nature. Today we met Ruedi and the researchers at 7:30am and headed to the park to look for anthills. Anita knew what she wanted, but it took Dave and I a while to work it out. Sounds like it’s tricky being an ant expert! 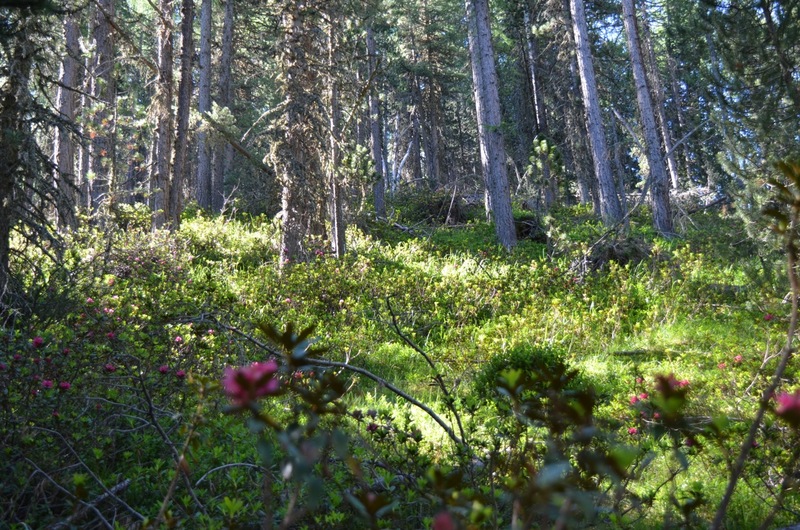 The hypothesis for the project involves the ants preferring certain tree species over others, so the nest has to be in an area where there are at least larch and spruce. The drone can’t fly well in a dense forest, so it has to be a bit open. There need to be a lot of ants to spot on the trees and branches, so it has to be a big nest. The nest needs to remain in use for the duration of the project, so if there are plants growing in it, it’s probably going to be abandoned soon and therefore won’t be any good. And finally, if it’s too close to the trail, the presence of the trail may have unknown impacts on the behaviour and those factors need to be excluded, so it can’t be used either. 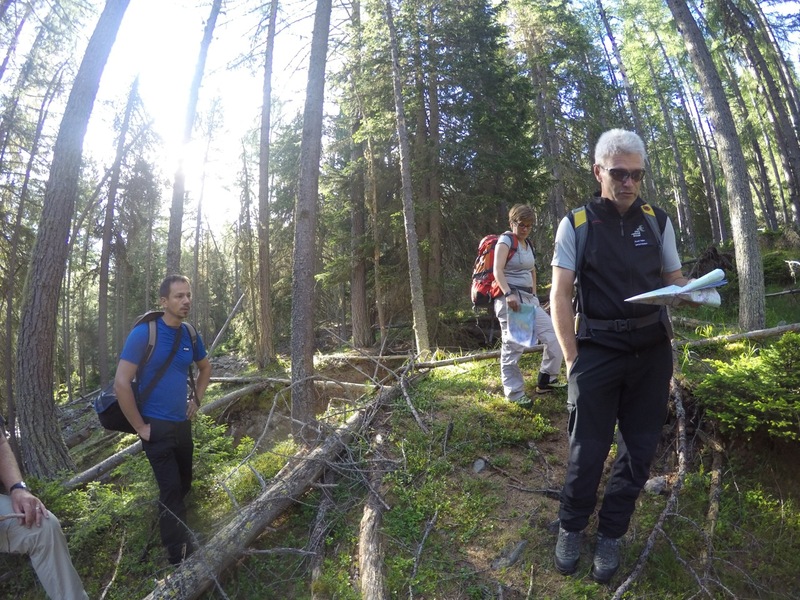 We headed out on the trail, Ruedi armed with a map of tree types (which the team had made on a previous project!). 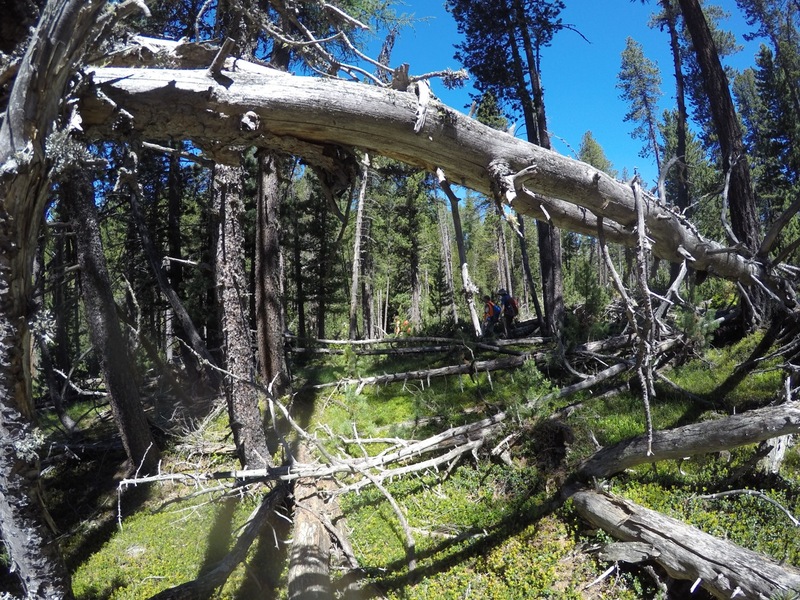 Then we’d leave the trail and spread out, walking off-road across moss, fallen trees and lots of blueberry plants in search of ants and their homes. 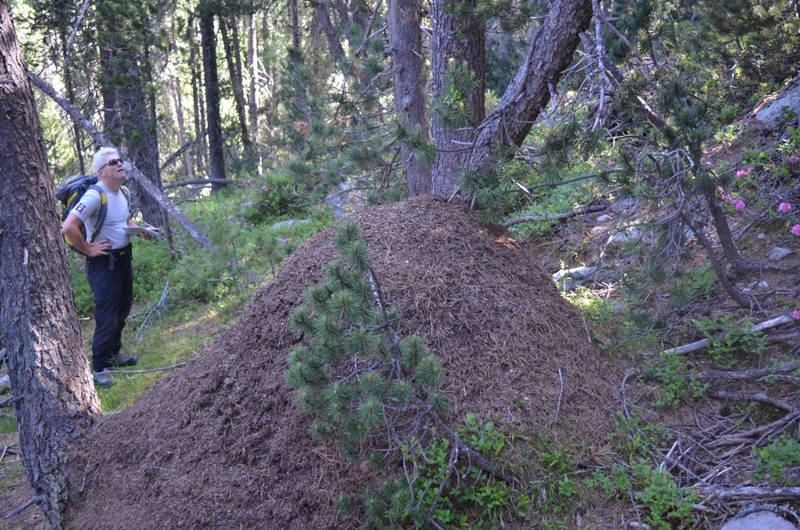 When we found a suitable ant mound, Ruedi took a waypoint on the GPS and noted down the location. On the way, we all had some interesting chats. The two post-graduate research interns Judith and Thomas are from Germany, so I managed to speak German for a day without having to constantly ask people to repeat things (I’m not very good with the Swiss accent!). Anita told us all about the ants on the way, and Dave talked to Martin a lot about conservation and the concept of wilderness, which was really interesting. It’s great when you get to chat to someone about those things who really knows what they’re talking about! Ruedi also told me and Dave a story about the nutcracker. The little black and white bird is the emblem of the National Park, but it hasn’t always been so beloved! In the early 1960s, some people in Switzerland (outside the National Park) hunted the nutcrackers because they saw that they ate the nuts of the pine trees and they wanted to protect the forest. In the late 1960s, it was realised that the birds don’t just eat the seeds, they also help to plant them! They stash seeds for the winter but only use 80-90% of their stash, leaving the rest to germinate. So the nutcracker is now a reminder that we don’t always know what we’re doing when we meddle with nature. In the National Park, there have been 100 years without human interference for this reason (oh, except the reintroduction of the bearded vulture, which is doing well here now). At lunchtime we left the forest and rested under the sun by an old Alp. We watched a few deer on the hill and Ruedi made us teas and coffees to go with our sarnies. 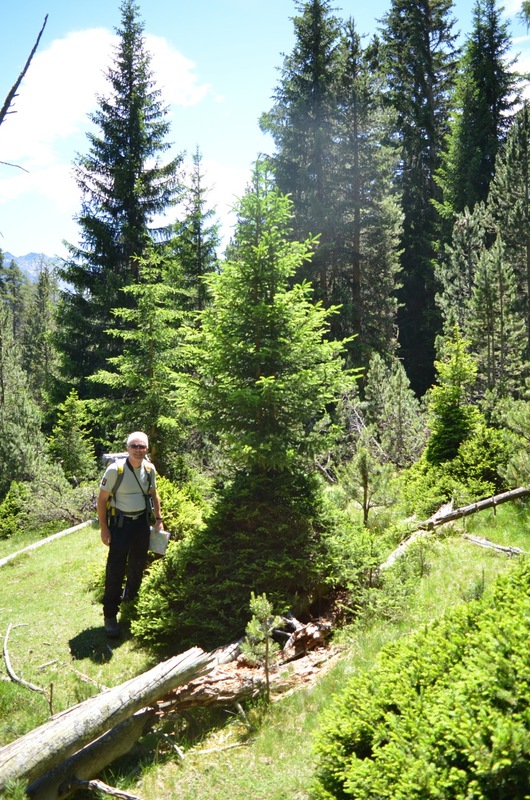 On the last section of trail, we saw a lot of comically shaped spruce trees. Ruedi told us these had been browsed by deer, but they were doing just fine. Once they manage to get out of reach, they shoot upwards and grow up to be healthy. Ruedi with a browsed spruce that has made its escape! After walking around in a lot of lovely forests, we eventually had about 20 suitable nests identified. Almost all the nests were spotted by Martin, so I’m not sure Dave and I helped much, but it was an interesting day out and a nice walk with plenty of food for thought. 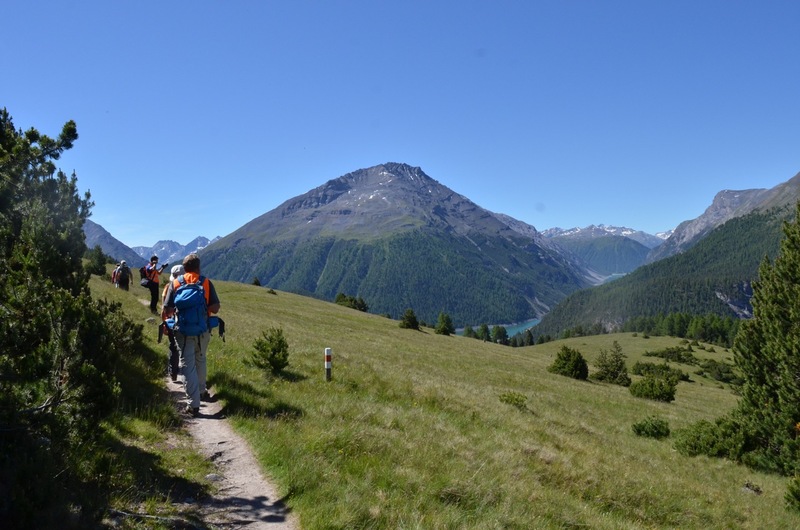 When we got back to Zernez, we were chatting to Ruedi about the next few days. He was telling us about a really interesting project on Friday when they’re going to flood the valley using the dam, in the hope of recreating natural floods in the future. So now of course we want to stay until Friday, but we really should leave on Thursday! We also discussed a walk we intend to do tomorrow, to a cirque at 2,900 m. Ruedi said it’s a long day out (about 9 hours) with 1500 m of up, and 1500m back down. “Have you ever done that before?”… Erm, no… “Then I think it’s better for you if I drive you in the car to the tree line.” After a short debate we decided to take his advice and his kind offer. Thanks Ruedi! Looking forward to tomorrow.